2001-09-19 Assigned to MICROSOFT CORPORATION reassignment MICROSOFT CORPORATION ASSIGNMENT OF ASSIGNORS INTEREST (SEE DOCUMENT FOR DETAILS). Assignors: RINGSETH, PAUL F., AL-GHOSIEN, MOMIN M., GREWAL, JASJIT S.
2002-01-22 Assigned to MICROSOFT CORPORATION reassignment MICROSOFT CORPORATION ASSIGNMENT OF ASSIGNORS INTEREST (SEE DOCUMENT FOR DETAILS). Assignors: RINGSETH, PAUL F., AL-GHOSIEN, MOMIN M., GREWAL, JASJIT S.
A system and methods are provided that make compile-time declarative modeling available for SOAP-based data transmission(s). The declarative modeling minimizes the amount of coding required of a developer. The underlying details regarding the SOAP protocol, dispatching to the appropriate object and function, marshing and un-marshing of XML and generating the SOAP response are hidden from the developer when implementing SOAP-based Web services. The task of creating a SOAP-based web service is thus greatly simplified by reducing the number and complexity of considerations required of the developer when generating SOAP-based Web services. In one embodiment, attributes for Visual C++ are utilized as a framework for a declarative syntax for SOAP-based Web services, which Visual C++ attributes have access to type and marshaling information. FIGS. 15A and 15B illustrate exemplary run-time processing of incoming or outgoing SOAP messages in accordance with the present invention. One of ordinary skill in the art can appreciate that a computer  110 or other client device can be deployed as part of a computer network. In this regard, the present invention pertains to any computer system having any number of memory or storage units, and any number of applications and processes occurring across any number of storage units or volumes. The present invention may apply to an environment with server computers and client computers deployed in a network environment, having remote or local storage. The present invention may also apply to a standalone computing device, having programming language functionality, interpretation and execution capabilities. FIG. 1 illustrates an exemplary network environment, with a server in communication with client computers via a network, in which the present invention may be employed. As shown, a number of servers  10 a, 10 b, etc., are interconnected via a communications network 14, which may be a LAN, WAN, intranet, the Internet, etc., with a number of client or remote computing devices 110 a, 110 b, 110 c, 110 d, 110 e, etc., such as a portable computer, handheld computer, thin client, networked appliance, or other device, such as a VCR, TV, and the like in accordance with the present invention. It is thus contemplated that the present invention may apply to any computing device in connection with which it is desirable to perform programming services that may utilize SOAP-based communications. In a network environment in which the communications network 14 is the Internet, for example, the servers 10 can be Web servers with which the clients 110 a, 110 b, 110 c, 10 d, 110 e, etc. communicate via any of a number of known protocols such as hypertext transfer protocol (HTTP) for the SOAP-based communications. Communications may be wired or wireless, where appropriate. Client devices 110 may or may not communicate via communications network 14, and may have independent communications associated therewith. For example, in the case of a TV or VCR, there may or may not be a networked aspect to the control thereof. Each client computer 110 and server computer 10 may be equipped with various application program modules 135 and with connections or access to various types of storage elements or objects, across which files may be stored or to which portion(s) of files may be downloaded or migrated. Any server 110 a, 110 b, etc. may be responsible for the maintenance and updating of a database 20 or other storage element in accordance with the present invention, such as a database 20 for storing software having the capabilities of the present invention. Thus, the present invention can be utilized in a computer network environment having client computers 110 a, 110 b, etc. for accessing and interacting with a computer network 14 and server computers 10 a, 10 b, etc. for interacting with client computers 110 a, 110 b, etc. and other devices 111 and databases 20. FIG. 2 thus illustrates an example of a suitable computing system environment  100 in which the invention may be implemented, although as made clear above, the computing system environment 100 is only one example of a suitable computing environment and is not intended to suggest any limitation as to the scope of use or functionality of the invention. Neither should the computing environment 100 be interpreted as having any dependency or requirement relating to any one or combination of components illustrated in the exemplary operating environment 100. With reference to FIG. 2, an exemplary system for implementing the invention includes a general purpose computing device in the form of a computer  110. Components of computer 110 may include, but are not limited to, a processing unit 120, a system memory 130, and a system bus 121 that couples various system components including the system memory to the processing unit 120. The system bus 121 may be any of several types of bus structures including a memory bus or memory controller, a peripheral bus, and a local bus using any of a variety of bus architectures. By way of example, and not limitation, such architectures include Industry Standard Architecture (ISA) bus, Micro Channel Architecture (MCA) bus, Enhanced ISA (EISA) bus, Video Electronics Standards Association (VESA) local bus, and Peripheral Component Interconnect (PCI) bus, also known as Mezzanine bus. The system memory  130 includes computer storage media in the form of volatile and/or nonvolatile memory such as read only memory (ROM) 131 and random access memory (RAM) 132. A basic input/output system 133 (BIOS), containing the basic routines that help to transfer information between elements within computer 110, such as during start-up, is typically stored in ROM 131. RAM 132 typically contains data and/or program modules that are immediately accessible to and/or presently being operated on by processing unit 120. By way of example, and not limitation, FIG. 2 illustrates operating system 134, application programs 135, other program modules 136, and program data 137. The computer  110 may also include other removable/non-removable, volatile/nonvolatile computer storage media. By way of example only, FIG. 2 illustrates a hard disk drive 141 that reads from or writes to non-removable, nonvolatile magnetic media, a magnetic disk drive 151 that reads from or writes to a removable, nonvolatile magnetic disk 152, and an optical disk drive 155 that reads from or writes to a removable, nonvolatile optical disk 156, such as a CD ROM or other optical media. Other removable/non-removable, volatile/nonvolatile computer storage media that can be used in the exemplary operating environment include, but are not limited to, magnetic tape cassettes, flash memory cards, digital versatile disks, digital video tape, solid state RAM, solid state ROM, and the like. The hard disk drive 141 is typically connected to the system bus 121 through a non-removable memory interface such as interface 140, and magnetic disk drive 151 and optical disk drive 155 are typically connected to the system bus 121 by a removable memory interface, such as interface 150. The drives and their associated computer storage media discussed above and illustrated in FIG. 2 provide storage of computer readable instructions, data structures, program modules and other data for the computer  110. In FIG. 2, for example, hard disk drive 141 is illustrated as storing operating system 144, application programs 145, other program modules 146, and program data 147. Note that these components can either be the same as or different from operating system 134, application programs 135, other program modules 136, and program data 137. Operating system 144, application programs 145, other program modules 146, and program data 147 are given different numbers here to illustrate that, at a minimum, they are different copies. A user may enter commands and information into the computer 110 through input devices such as a keyboard 162 and pointing device 161, commonly referred to as a mouse, trackball or touch pad. Other input devices (not shown) may include a microphone, joystick, game pad, satellite dish, scanner, or the like. These and other input devices are often connected to the processing unit 120 through a user input interface 160 that is coupled to the system bus 121, but may be connected by other interface and bus structures, such as a parallel port, game port or a universal serial bus (USB). A monitor 191 or other type of display device is also connected to the system bus 121 via an interface, such as a video interface 190. In addition to the monitor, computers may also include other peripheral output devices such as speakers 197 and printer 196, which may be connected through an output peripheral interface 195. The computer  110 may operate in a networked environment using logical connections to one or more remote computers, such as a remote computer 180. The remote computer 180 may be a personal computer, a server, a router, a network PC, a peer device or other common network node, and typically includes many or all of the elements described above relative to the computer 110, although only a memory storage device 181 has been illustrated in FIG. 2. The logical connections depicted in FIG. 2 include a local area network (LAN) 171 and a wide area network (WAN) 173, but may also include other networks. Such networking environments are commonplace in offices, enterprise-wide computer networks, intranets and the Internet. When used in a LAN networking environment, the computer  110 is connected to the LAN 171 through a network interface or adapter 170. When used in a WAN networking environment, the computer 110 typically includes a modem 172 or other means for establishing communications over the WAN 173, such as the Internet. The modem 172, which may be internal or external, may be connected to the system bus 121 via the user input interface 160, or other appropriate mechanism. In a networked environment, program modules depicted relative to the computer 110, or portions thereof, may be stored in the remote memory storage device. By way of example, and not limitation, FIG. 2 illustrates remote application programs 185 as residing on memory device 181. It will be appreciated that the network connections shown are exemplary and other means of establishing a communications link between the computers may be used. A SOAP message is an XML document that comprises a SOAP envelope, an optional SOAP header and a SOAP body. The basic format of a SOAP message is illustrated in exemplary pseudocode  300 of FIG. 3A. The SOAP envelope is the top element of the XML document representing the message. The SOAP header is a generic mechanism for adding features to a SOAP message in a decentralized manner without prior agreement between the communicating parties. SOAP defines a few properties that can be used to indicate who should deal with a feature and whether it is optional or mandatory. The SOAP body is a container for mandatory information intended for the ultimate recipient of the message. For the envelope, the element name is “Envelope” and is present in the SOAP message. The element may contain namespace declarations as well as additional properties. If present, such additional properties are namespace-qualified. Similarly, the element may contain additional sub elements, but if present these elements are namespace-qualified and follow the SOAP body element. An example of a header with an element identifier of “Transaction,” a “mustUnderstand” value of “1” and a value of 5 may be encoded as shown in the exemplary code  305 of FIG. 3B. 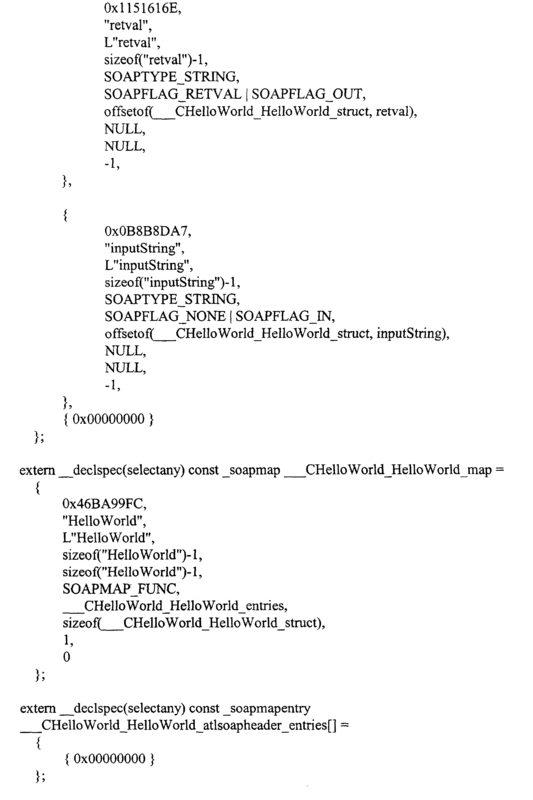 The format and processing of a typical “Hello World”-style HTTP SOAP request in connection with the C++ function pseudocode  400 of FIG. 4A are described in connection with the block diagram of FIG. 4B. 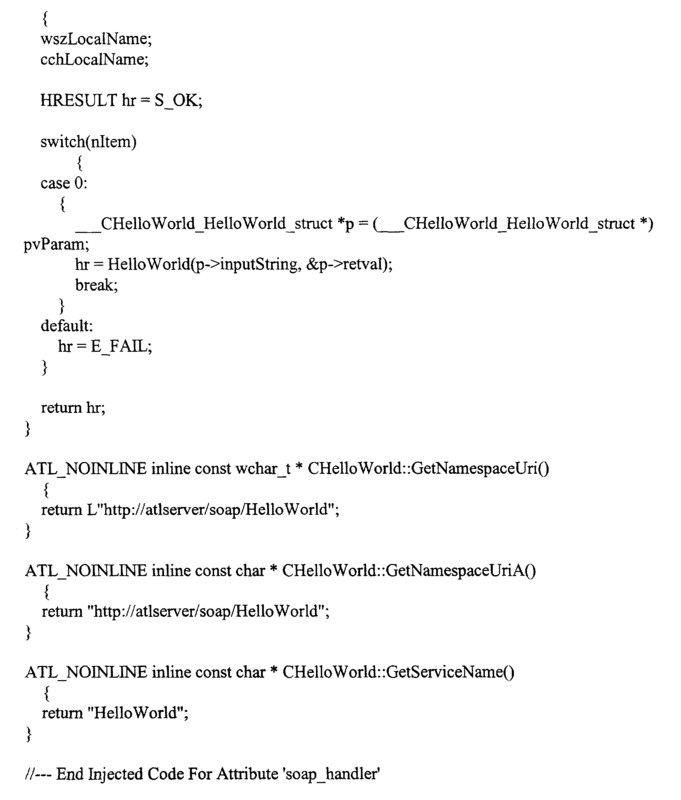 The function named “HelloWorld” takes a string parameter as input i.e., a BSTR is a string type, and the function also returns a string. Code or pseudocode  400 implicates a typical scenario by which a function can be invoked remotely via SOAP and HTTP. FIG. 4B illustrates the lifetime of a SOAP HTTP request. Client 410 sends a SOAP HTTP Request 420 to server 430 and server 430 responds to client 410 via SOAP HTTP Response 440. The format of a typical “Hello World” SOAP HTTP request is illustrated in FIG. 4C by exemplary pseudocode  450. The first part of the request contains common HTTP headers, with the addition of an HTTP SOAP request-specific SOAPAction header. The SOAP message portion follows the format described above (note the absence of the “Header” element). 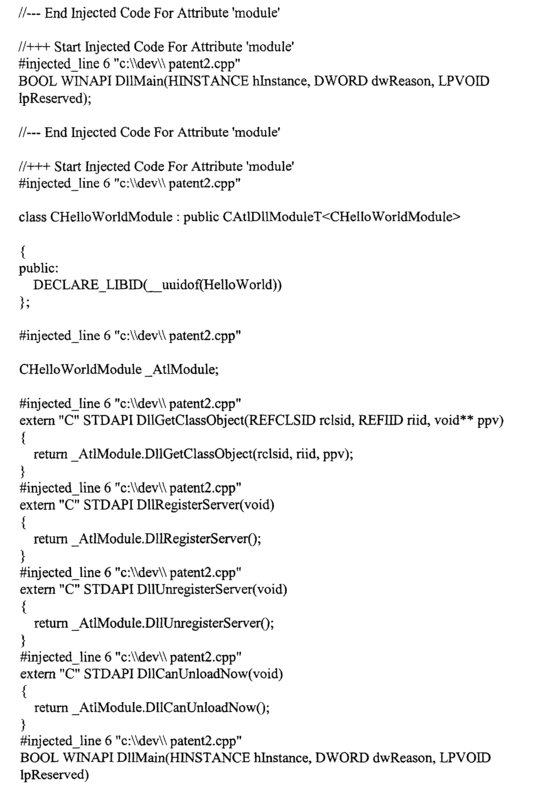 The user data under the “Body” property is one possible encoding of a “Hello World” RPC request. The element “inputString” is a parameter to the function “HelloWorld” and has the value “StringValue”. 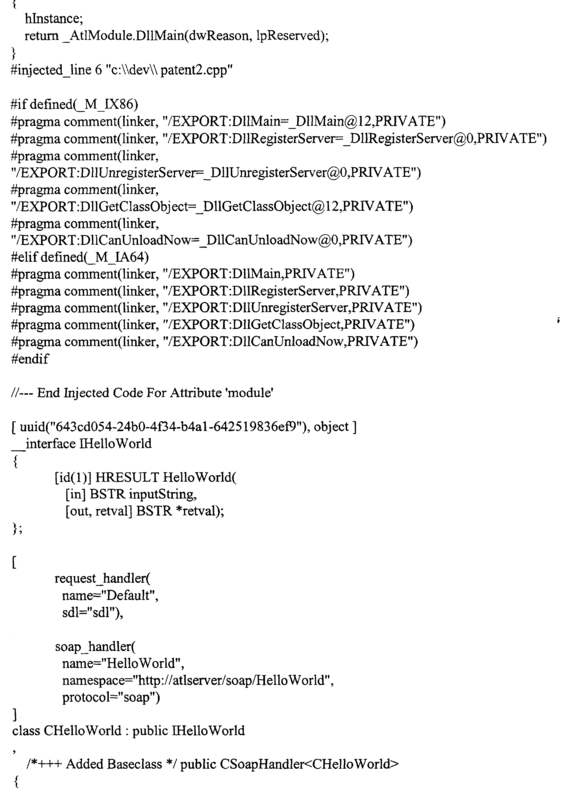 When the server  430 receives this message, server 430: (i) determines the intended recipient of the message comprising the “Hello World” function, (ii) parses the XML of the message and marshals the parameters e.g., “inputString,” into real C++ data types i.e., a string in this case, (iii) calls the intended recipient of the “Hello World” function with the expected parameters e.g., “inputString” and (iv) after the function call, server 430 takes the output parameters and return value and generates a SOAP HTTP response message to send back to the client 410. The format of a typical “Hello World” SOAP HTTP response is illustrated by exemplary pseudocode  455 of FIG. 4D. One of ordinary skill in the art can appreciate from the description of the steps that server  430 executes for each message that the user/developer must implement a great deal of XML parsing and XML generating code, and this code must be rewritten for each different function/message that the server 430 wishes to expose via SOAP. In this regard, the present invention greatly simplifies creating a SOAP-based web service by reducing the number and complexity of considerations required of the developer when generating SOAP-based web services. 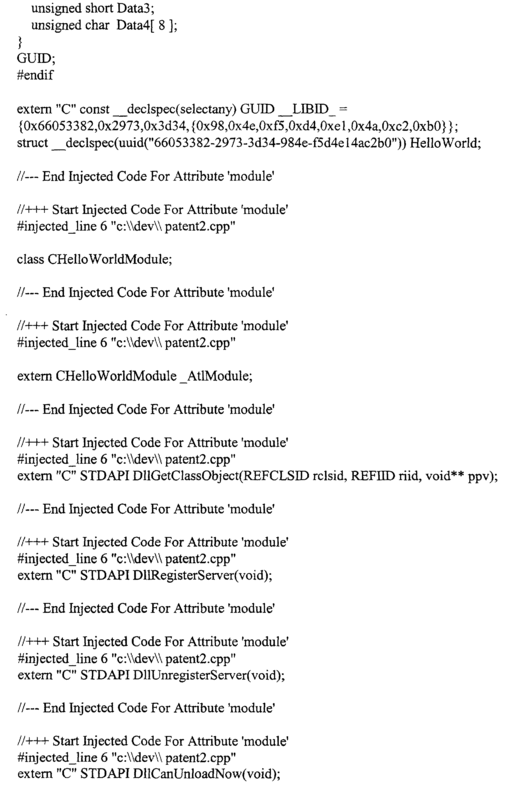 Appendix A provides an example of the amount of code a user would typically have to write just to implement the “Hello World” example. Exemplary code  460 of FIG. 4E illustrates an implementation of the “Hello Word” example utilizing the present invention. A comparison of the code of Appendix A and the exemplary code 460 of FIG. 4E illustrates a contrast between the repetitive, error-prone code a developer would have to write without the present invention, and the simple code the developer can write using the invention. 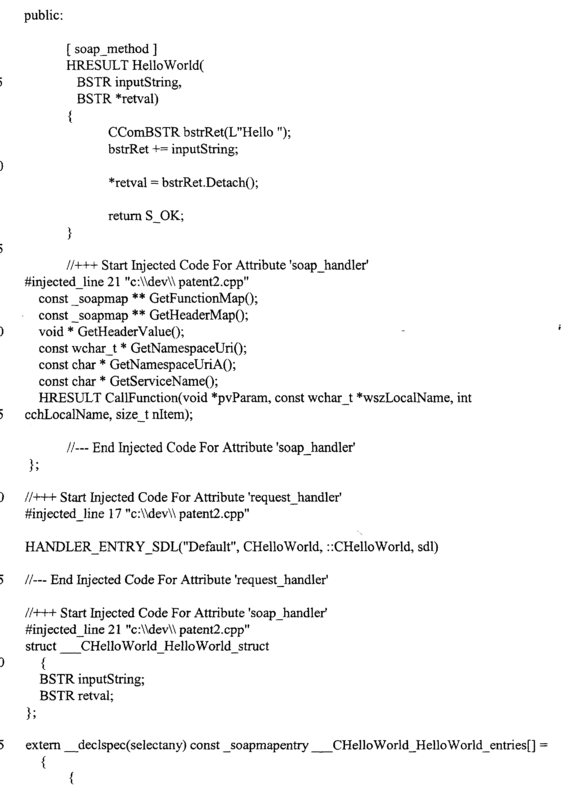 The user-implemented code of Appendix A is approximately 350 lines of code. The user would then have to duplicate much this code for each function for which exposure is desirable via SOAP. In contrast, code 460 comprises a mere 40 lines of code, and all of the details regarding the SOAP protocol, dispatching to the appropriate object and function, marshaling the XML, un-marshaling the XML, and generating the SOAP response are all hidden from the user. The term(s) marshaling or marshaling information as used herein refers to the code and/or data generated at compile time in connection with the generation of SOAP messages from programming language constructs, and the generation of programming language constructs from SOAP messages. The invention thus frees the developer to focus on the code to specify the description of the web service, and the code specific to their application. Exemplary code  500 of FIG. 5 illustrates format for code that a user would potentially write in accordance with the declarative syntax of the present invention, where uuid is a UUID string, e.g. “643cd054-24b0-4f34-b4a1-642519836fe8”, soapMethod1 or soapMethod2 is any valid C++ identifier, id1_attributes is some combination of the in, out, size_is and retval IDL attributes, type[1 . . . N] is any integral or user-defined C++ type, parameters [1 . . . N], header[1 . . . N] are any valid C++ identifiers and wsdlName1 or wsdlName2 can be any valid C++ identifier. In accordance with the present invention, the following new attributes are used in the implementation of a web service: soap_handler, soap_method and soap_header. These attributes appear in the web service's class declaration. Soap_handler applies to a class and marks the class as handling SOAP requests. There are parameters for specifying the name of the Web service and the XML namespace for the user-data that appears under the SOAP “Header” and “Body” elements. Soap_method applies to a method and marks the method as being exposed via SOAP. There is an optional parameter for specifying the exposed name of the method. The method's data will appear under the SOAP “Body” element. Soap_header applies to a method and marks the method as receiving and/or sending a specified class member variable as a SOAP header. There are optional parameters for specifying if it is an in header, an out header, and whether or not the header is required (see above for a description of “mustUnderstand” headers). The optional soap_header attribute can only be used on methods that also have the soap_method attribute. 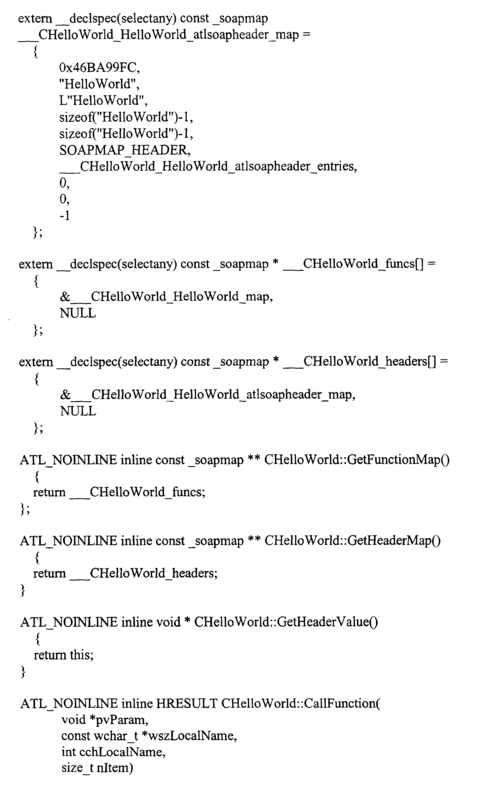 The “Hello World” example of code  460 from FIG. 4E exemplifies use of the soap_handler and soap_method attributes, but does not make use of the soap_header attribute. Other non-limiting examples are described below. Exemplary code  600 of FIG. 6 illustrates the implementation of a SOAP Method with integral types as parameters. In this case, “method1” has two parameters named “bInput” and “bOutput”. In the class declaration, the optional “name” parameter of the “soap_method”attribute has been omitted. When omitted, the “name” defaults to the name of the method, which in this case is “method1.” The optional “soap_header” attribute has also been omitted, an exemplary use of which is described below. When processing code  600, the parser sees the object attribute which causes the subsequent_interface to be a COM interface. Embedded IDL is only allowed in COM interfaces which are characterized by being annotated with the “object”, “dual” or “dispinterface” attributes. When processing, the parser sees the “soap_method” attribute and calls into the attribute provider, which adds “method 1” to the list of methods to be exposed via SOAP. When called back at the end of the class by the compiler, the attribute provider iterates over these methods and queries the compiler for a description of the method, including the parameter names, types, and their IDL attributes: ([in] Thool;PbInput;[out,retval] Thool;*PbOutput;)THRESULT;. The attribute provider parses this information and generates data that is used at runtime to process SOAP requests, as shown in cumulative in exemplary code 700, 705, 710, 715, 720 and 725 of FIGS. 7A through 7F. Finally, the attribute provider injects implementations for the member functions and implementation maps it declared for the “soap_handler” attribute, as shown in the exemplary code  800 beginning in FIG. 8A and continued and ending in FIG. 8B. In this case, “method 1” has two parameters named “bInput” and “bOutput”. In the class declaration, the optional “name” parameter of the “soap_method” attribute has been omitted. When omitted, the “name” defaults to the name of the method which in this case is “method1.” The optional soap_header attribute has been added. The parser sees the “soap_method” attribute and calls into the attribute provider, which adds “method 1” to the list of methods to be exposed via SOAP. At the end of the class, the attribute provider iterates over these methods and queries the compiler for a description of the method, including the parameter names, types, and their IDL attributes: ([in] Tbool;PbInput;[out,retval] Tbool;*PbOutput;)THRESULT;. The attribute provider parses this information and generates data that is used at runtime to process SOAP requests, as shown in cumulative in exemplary code  1000, 1005 and 1010 of FIGS. 10A through 10C. The parser sees the “soap_header” attribute and calls into the attribute provider, which adds “Header 1” to the list of headers to process for “method1”. The attribute has its “in” parameter value set to true, which specifies that the method will expect an XML element named “Header1” in the SOAP request to appear under the SOAP “Header” element. When called back at the end of the class by the compiler, the attribute provider iterates over the headers for each method and queries the compiler for information about the header and injects marshaling data, as shown in cumulative in exemplary code 1015, 1020 and 1025 of FIGS. 10D through 10F. The data is nearly identical to that injected for method parameters. As can be inferred from the code  1015, 1020 and 1025, the injected data includes information for marshaling “Header1” of the soap_method: its name, its memory offset into the class (offsetof(CClass, Header1)), its type (SOAPTYPE_INT) and that it is an “in” header (SOAPFLAG_IN). There is a one-to-one correspondence between the injected data and the “soap_header” declaration. Finally, the attribute provider injects implementations for the member functions and implementation maps it declared for the “soap_handler” attribute, as shown in the exemplary code  1100 beginning in FIG. 11A and continued and ending in FIG. 11B. Exemplary code  1200 of FIG. 12 illustrates the implementation of a SOAP Method with complex type parameters. This example illustrates how arrays and complex types e.g., structs, enums, etc., are processed. Code 1200 is similar to code 600 of the first example, with the parameters of method1 changed to an enum and a struct that has an array as a member. The interaction between the compiler and the attribute provider is the same as for the first example, except for the description returned by the compiler when queried for information about “method 1”: ([in] LTestStruct;PtIn;[out,retval] ETestEnum; *PeOut;)THRESULT;. This description “LTestStruct” identifies the “tIn” parameter as type “TestStruct”, which is a struct (the “L” prefix); and the parameter “eOut” parameter as type “TestEnum”, which is an enum (the “E” prefix). When the attribute provider encounters these definitions while parsing the description, the attribute provider queries the compiler for information about TestStruct and TestEnum and generates data to marshal those types, as shown in cumulative in exemplary code 1300, 1305, 1310, 1315, 1320, 1325 and 1330 of FIGS. 13A through 13H. As can be inferred from the code  1300, 1305, 1310, 1315, 1320, 1325 and 1330 by one of ordinary skill in the art, the injected data includes marshaling information for creating SOAP messages in connection with the TestStruct and TestEnum types i.e., the element names, types, and offsets into their parent type, and the injected data for the method contains a pointer to the data for TestStruct and TestEnum. The injected data also contains information about the “arr” array field of TestStruct, which is used to marshal the array e.g., the number of array dimensions and the size of each dimension. Additionally, just as method parameter types can be structs, enums and other user-defined types, struct fields types can be structs, enums and other user-defined types. All other injected code and data generated is the same as in the first example described above in connection with FIGS. 6 through 8B. FIGS. 14A through 14F illustrate exemplary processing of a C++ file containing the declaratory syntax of the invention for a SOAP-based Web service. In FIG. 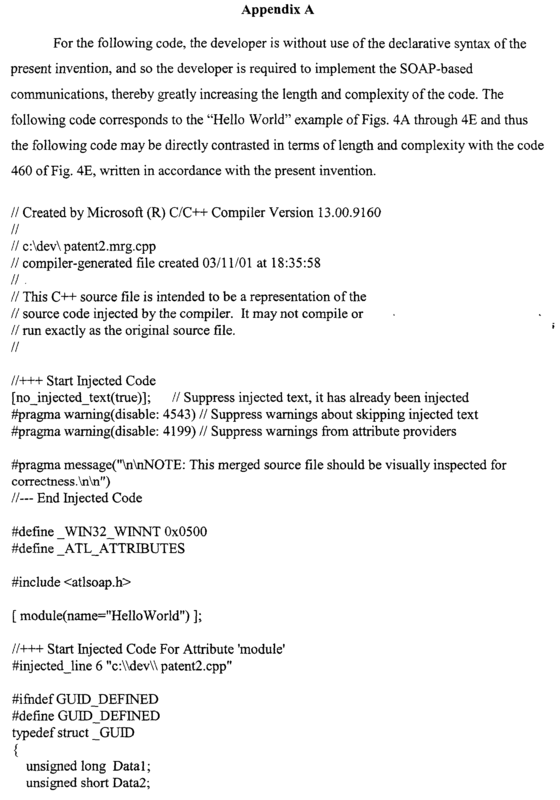 14A, at  1400, a C++ file containing SOAP web service description is received by a compiler. At 1402, the compiler begins parsing the file. At 1404, the compiler encounters an attribute block having the declarative syntax of the invention. At 1406, the compiler recognizes uuid and object attributes, and allows the interface definition that follows to contain embedded IDL. At 1408, the compiler parses the interface definition as described in more detail in connection with FIG. 14B below. At 1410, the compiler continues parsing the file as described in more detail in connection with FIG. 14C below. In FIG. 14B, at  1412, for each function in the interface, the compiler performs 1414. At 1414, the compiler parses the function declaration, and saves the IDL parameter attribute information e.g., in, out, retval, size_is, which is used later in determining SOAP message structure. In FIG. 14C, at  1416, the compiler encounters a soap_handler attribute. At 1418, the compiler recognizes soap_handler as an attribute that is supported by the attribute provider, for example, as embodied in a dynamic link library file. At 1420, the compiler calls into the attribute provider. At 1422, the attribute provider marks the class on which the soap_handler attribute appears as handling SOAP messages. At 1424, the attribute provider returns control to the compiler. FIG. 14D illustrates exemplary processing by the compiler at  1424. At 1426, the compiler begins parsing the body of the class on which the soap_handler attribute appears. At 1428, the compiler parses each function in the class. At 1430, for each soap_header attribute on the function, the compiler performs processing at 1432 as described in more detail in connection with FIG. 14E. At 1434, if the function has a soap_method attribute, the compiler performs processing at 1436 as described in more detail in connection with FIG. 14F. FIG. 14E describes exemplary processing for each soap_header attribute on the function. At  1438, the compiler encounters a soap_header attribute. At 1440, the compiler recognizes soap_header as an attribute that is supported by the attribute provider. At 1442, the compiler calls into the attribute provider. At 1444, the attribute provider gathers information necessary to create the “Header” part of a SOAP message. At 1446, the attribute provider queries the compiler for information about the parameters to the soap_header attribute. At 1448, if the “in” parameter is set to true, the attribute provider generates data for a SOAP message to receive this header. At 1450, if the “required” parameter is set to true, the attribute provider generates data that results in a runtime error if this header is not received e.g., if “in” is true, and ensures that it is sent, e.g., if “out” is true. At 1452, if the “out” parameter is set to true, the attribute provider generates data for a SOAP message to send this header. At 1454, the attribute provider queries the compiler for information about the data type for the header e.g., a C++ member variable, and generates the information for creating that portion of the SOAP message Header. At 1456, the attribute provider returns control to compiler. FIG. 14F describes exemplary processing if the function has a soap_method attribute. At  1458, the compiler encounters a soap_method attribute. At 1460, the compiler recognizes soap_method as an attribute that is supported by the attribute provider. At 1462, the compiler calls into the attribute provider. At 1464, the attribute provider gathers information to create a SOAP message for this function. At 1466, the attribute provider queries the compiler for information about the parameters to the function on which soap_method attribute appears. At 1468, for each parameter on the function, (i) at 1470, the attribute provider uses the IDL information gathered in FIGS. 14A and 14B to determine which function parameters are to be received as part of the incoming SOAP message, and which parameters are to be sent back as part of the SOAP message response and (ii) at 1472, the attribute provider queries the compiler about the data type of the parameter and generates the data to create the correct SOAP message portion for this parameter. At 1474, the attribute provider returns control to compiler. FIGS. 15A and 15B illustrate exemplary run-time processing of incoming or outgoing SOAP messages in accordance with the present invention. In contrast to FIG. 4B, an intermediate layer  1520 is between a user object 1510 of a server application 1500 and a request 420 or a response 440. Intermediate layer 1520 intercepts incoming SOAP messages 1530 and handles outgoing SOAP messages 1540, and serves to communicate appropriately with user object 1510. The code and data generated at compile-time in accordance with the present invention is utilized when run-time processing. Since the code and data for generating, sending, receiving and converting SOAP messages has already been generated at compile-time, valuable time and computing resources are saved at run-time. FIG. 15B illustrates the processing of block  1535 in exemplary non-limiting detail. In connection with an incoming SOAP message 1530, at 1550, the runtime intermediate layer 1520 determines the appropriate user object 1510 to receive the request. At 1560, the runtime intermediate layer 1560 uses the code and data created at compile-time to convert the incoming SOAP message to the appropriate programming language constructs, such as C++ constructs. At 1570, an appropriate call is made to the appropriate user object 1510 with the transformed data 1570. For outgoing SOAP messages 1540, at 1570, the user object 1510 has sent a call containing a programming language construct to be transformed into an appropriate SOAP message. At 1580, the runtime intermediate layer 1520 uses the code and data generated at compile-time to convert the programming language construct into a correctly formatted outgoing SOAP message. At 1590, the runtime intermediate layer 1520 writes the HTTP response for delivery to client 410.
generating at least one of additional code and data for use at run-time when at least one of sending and receiving a SOAP message for said at least one SOAP-based Web service occurs. 3. A method according to claim 2, wherein said declaring includes declaring at least one C++ attribute corresponding to at least one SOAP-based Web service. 4. A method according to claim 1, wherein when sending a SOAP message for said at least one SOAP-based Web service, the method further includes utilizing said at least one of additional code and data at run-time to generate the SOAP message. 5. A method according to claim 1, wherein when receiving a SOAP message for said at least one SOAP-based Web service, the method further includes utilizing said at least one of additional code and data at run-time to convert said SOAP message to an object of the programming language. 6. A method according to claim 1, wherein said declaring reduces the amount of code a developer writes relative to writing the code without said declaring. 7. A method according to claim 1, wherein said declaring includes describing at least one Web service interface using embedded interface definition language (IDL). 8. A method according to claim 1, wherein said provider object communicates with the compiler of said code to generate said at least one of additional code and data. 9. A method according to claim 1, wherein via said declaring, said method hides from the developer the underlying details regarding the SOAP protocol, dispatching to the appropriate object and function, marshaling the (extensible Markup Language) XML, un-marshaling the XML, and generating the SOAP response. 10. A method according to claim 1, wherein the underlying XML packaging of the SOAP message is transported according to said at least one of sending and receiving via at least one of hypertext transfer protocol (HTTP), file transfer protocol (FTP), transmission control protocol (TCP), user datagram protocol (UDP), internet relay chat (IRC), telnet protocol and Gopher protocol. 11. A method according to claim 1, wherein said provider object is an attribute provider object and said attribute provider object has access to attribute type and marshaling information. 12. A method according to claim 1, wherein for each method of said code that is to be exposed as part of the at least one Web service, the method is introduced via an interface as part of an interface definition language (IDL) description. 13. A method according to claim 12, wherein said declaring further includes specifying at least one of in, out, size_is and retval IDL attributes in the at least one Web service's interface declaration. 14. A method according to claim 1, wherein said declaring includes declaring at least one of a soap_handler attribute, a soap_method attribute and a soap_header attribute. 15. A method according to claim 14, wherein said at least one of a soap_handler attribute, a soap_method attribute and a soap_header attribute are declared in the at least one Web service's class declaration. 16. A computer readable medium bearing computer executable instructions for carrying out the method of claim 1. 17. A modulated data signal carrying computer executable instructions for performing the method of claim 1. 18. A computing device comprising means for performing the method of claim 1. 20. A method according to claim 19, wherein said embedded information is implemented via interface definition language (IDL). 21. A method according to claim 19, further including determining whether said attribute block includes an object attribute. 22. A method according to claim 21, wherein for each function in the interface definition, the compiler parses the function declaration, and saves the parameter attribute information for use later in determining a (Simple Object Access Protocol) SOAP message structure. 23. A method according to claim 19, wherein when the compiler encounters a soap_handler attribute, the compiler recognizes soap_handler as an attribute that is supported by an attribute provider and calls into the attribute provider. 24. A method according to claim 23, wherein the attribute provider marks the class on which the soap_handler attribute appears as handling (Simple Object Access Protocol) SOAP messages and then the attribute provider returns control to the compiler. 25. A method according to clam 24, wherein after said return of control, the compiler begins parsing the body of the class on which the soap_handler attribute appears and parses each function in the class. 26. A method according to 25, wherein for each soap_header attribute on the function, the compiler performs soap_header attribute processing. 28. A method according to claim 26, wherein said soap_header attribute processing includes generating the information for creating a portion of the (Simple Object Access Protocol) SOAP message header and returning control from the attribute provider to the compiler. 30. A method according to claim 29, wherein said soap_method attribute processing includes recognizing a soap_method attribute as an attribute that is supported by the attribute provider and calls into the attribute provider whereby the attribute provider (i) gathers information to create a (Simple Object Access Protocol) SOAP message for the function and (ii) queries the compiler for information about the parameters to the function on which soap_method attribute appears. 31. A method according to claim 30, wherein for each parameter on the function, the attribute provider (i) uses the interface definition information to determine which function parameters are to be received as part of the incoming SOAP message, and which parameters are to be sent back as part of the SOAP message response and (ii) queries the compiler about the data type of the parameter. 32. A method according to claim 29, wherein said soap_method attribute processing includes generating the data to create the SOAP message portion for a parameter and returning control from the attribute provider to the compiler. 33. A computer readable medium bearing computer executable instructions for carrying out the method of claim 19. 34. A modulated data signal carrying computer executable instructions for performing the method of claim 19. 35. A computing device comprising means for performing the method of claim 19.
wherein said runtime intermediate layer utilizes at least one of code and data generated during compilation of said user object. 37. A method according to claim 36, wherein said programming language is C++. 38. A method according to claim 36, wherein said converting of said incoming SOAP message to a corresponding programming language construct includes determining the appropriate user object to receive the SOAP message. 39. A method according to claim 36, wherein said converting said call with at least one programming language construct to an outgoing SOAP message includes formatting the message for delivery to an intended client computing device. 40. A computer readable medium bearing computer executable instructions for carrying out the method of claim 36. 41. A modulated data signal carrying computer executable instructions for performing the method of claim 36. 42. A computing device comprising means for performing the method of claim 36.